Just back from California spending one week of Volkswagen fun! Nevertheless I’ve got some mixed feelings about certain meetings. Some gatherings are past of the high point, whereas a couple of new or more recent events are booming. Dynamics is the key word to meetings where a real ‘ignition’ power has been inserted. They go at full speed. Meetings and gatherings are crucial to our (VW) industry. Without them there wouldn’t be many old Volkswagens driving around and furthermore they are a fine reason to achieve the deadlines! You can compare it with our market segment. Good management and dynamics can make the difference between a fine working VW shop or a bad going shop…keep the spirit and be creative, those are the only advices I can give you! There are several big VW events scheduled. We’ll have a stand on Le Bug Show at the historical race circuit of Spa Francorchamps. I hope we’ll meet each other on one of these occasions. Chatting among Volkswagens is always a nice thing to do, isn’t it? As from 1 July 2016 prices may be adjusted in between, resulting from the fluctuating world market (exchange rate, change of supplier, production etc.). We’ll do our best to maintain prices stable for 3 months whenever possible, but we prefer to increase our prices instead of stopping delivery of certain parts. The new prices will immediately be modified in our web shop. This implies that the price of a product in our web shop will always be applied. Of course, we’ll do our upmost to prevent price increases, though sometimes we do not have another choice. You can either buy the bumper guards separately or together with the bumper guard protection rubbers. Or if your original bumper guard protection rubbers are worn out you can replace them with ours! This kit is all complete including hardware to mount that cool ragtop back together! Exactly made like original, 100% quality guaranteed! fits like original! Comes will all necessary hardware. This T-latch looks just the same as the T-latch of an old beetle engine lid, however it is completely different. Hereby youll find the correct BBT latch for the rear trap of your VW bus built between 1955 and 1962 (with a small rear trap). The nut to secure the latch is available under BBT ref. 8731-06. Seal between the fuel floater and the gas tank for the later years of the air-cooled crew. A dry or broken seal can give you a lot of gas odor inside the car, dangerous (gas burns you know) and not very nice neither! After years of supply of only used trim plates were proud we can deliver the chrome surrounding trim plates for your inner door handles for early bus brand new out of our stock, also the small inner finger plates are available new from the BBT shelves. These trim plates do also fit on all VW 411 and 412 models and VW Porsche 914 built 1973 and up. This small rubber strip sits vertically between the cab floor and the raised upmetal walk through section. European model Bay window buses didnt had side reflectors, but all bay window buses made for US export needed to have them. As more and more buses are being imported from all over USA into Europe the demand for the almost always broken reflectors grew very fast in the last few years. Therefore were very proud we can present a whole line of reflectors to replace your needs. These tubes from Auto Craft are located under your splittie to ensure that all cables are properly guided in the way they should. Available now from the BBT HQ shelves. Bay window buses have a double brake fluid reservoir, one of them is placed directly on the master cylinder which is connected with a higher placed filling reservoir. These reservoirs are nowadays often hardened and weary mainly resulting from the quality of the plastic used in the seventies in combination with the influences of a strong product such as brake fluid. Now we have a perfect alternative for the reservoirs placed directly on the master cylinders and you can replace your old reservoir by a complete new one for a safe brake feeling! This ground strap makes sure the ground stays connected to your steering column all over your steering coupler, necessary for a proper working horn. Maybe you dont live in India or Indonesia where horns are 100% necessary to survive in traffic, but a proper working horn is always a very nice feature on ANY car. Or as my quote always says; when the horn works the car must be ok! worn out or missing? 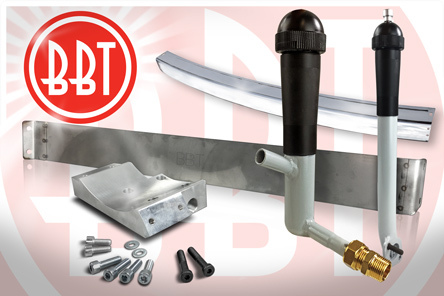 No problem, BBT offers you the perfect replacement part! Especially for competition engines. Reduces the resistance. The gear wheel of the camshaft is adjustable to accelerate or to delay a few degrees with regard to the crankshaft. a must to have in stock for every self respecting Classic VW workshop! Were proud we can finally offer a perfect alternative exhaust for your 181. Thing, Acapulco, Trekker or whatever you want to call the Volkswagen type 181 leisure car. The exhaust is made by Vintage Speed and offers the same quality and fit like any other Vintage Speed exhaust. Nice quality and good looking too! Finally the perfect solution for your Thing exhaust issues!